Former Alaska Senator Ted Stevens, 86, has died in a plane crash in Alaska while en route to a fishing trip. Former Nasa chief Sean O'Keefe was also aboard the small plane with his teenage son but both survived. Officials said five people had been killed and four had survived - with two badly hurt. The wreckage is located on a mountainside near the town of Dillingham. Rescue and recovery efforts were slowed by bad weather. Mr O'Keefe is in a critical condition and his son is being treated for serious injuries, an Alaskan hospital official said on Wednesday. President Barack Obama paid tribute to Mr Stevens in a statement. "A decorated World War II veteran, Senator Ted Stevens devoted his career to serving the people of Alaska and fighting for our men and women in uniform," he said. "Michelle and I extend our condolences to the entire Stevens family and to the families of those who perished alongside Senator Stevens in this terrible accident." Media captionAlaska Governor Sean Parnell: "He (Ted Stevens) will be deeply missed here and beyond"
Also killed was the pilot, Theron "Terry" Smith, 62, and a 16 year-old. Mr O'Keefe and his teenage son suffered broken bones and other injuries, former NASA spokesman Glenn Mahone said. 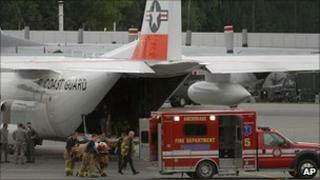 The alarm was raised on Monday evening when the plane failed to land on schedule. Shortly afterwards, local residents spotted the wreckage on the side of a mountain about 17 miles north of Dillingham. Harsh weather conditions hampered the rescue effort until early the next morning, and Alaska National Guard used helicopter hoists to rescue four survivors. Several local Samaritans had reached the wreckage before rescuers could arrive and tended to the survivors, officials said. The survivors were flown to Anchorage. A crash investigation team arrived in the afternoon from Washington DC. A Federal Aviation Administration spokesman said the downed plane was a 1957 DeHavilland DHC-3T and was registered to Anchorage-based General Communications Incorporated (GCI). Spokesman Mike Fergus said the plane had been headed to Agulowak Lodge on Lake Aleknagik from a site owned by GCI on Lake Nerka. Mr Fergus said the plane had not been required to file a flight plan because it was flying by visual flight rules. Mr Stevens and Mr O'Keefe often went fishing together, and the former Alaska senator was planning a fishing trip near Dillingham, friend William Canfield told the Associated Press news agency. In a statement, Mr Stevens' family praised his dedication to Alaska, saying "his legacy is the 49th star on the American flag", a reference to Alaska's place as the 49th state in the US. "Alaska and the nation he so loved have lost a great man," the family said. "We have lost a tremendous husband and father and grandfather. He loved Alaska with all his heart." Mr Stevens was the longest-serving Republican in the history of the Senate, having been appointed to the body in 1968 and won election two years later. He was voted out of office in 2008 after being found guilty of seven felony charges of failing to disclose costly home renovations and gifts given by an oil services company. He was narrowly defeated by Democrat Mark Begich. But in April 2009 a federal judge overturned the convictions and exonerated him, citing prosecutorial missteps. During his tenure in the Senate, Mr Stevens was renowned for his ability to draw federal tax dollars back to Alaska. One of his best-known projects - known as the "Bridge to Nowhere" - was the focus of criticism by US groups who queried the more than $400m (£252m) price tag for the bridge's construction, noting it was to serve only a tiny population on an isolated island. Mr Stevens was one of two survivors of a 1978 plane crash at Anchorage International Airport in Alaska that killed his wife, Ann, and several others. Mr O'Keefe led Nasa from December 2001 to February 2005, having been nominated for the position by President George W Bush. His tenure at the space agency was marked by major accomplishments, such as landing the two Mars Exploration Rovers on the surface of the Red Planet. But he was also in charge during the Columbia space shuttle disaster, which resulted in the loss of seven astronauts. The panel investigating the incident made numerous recommendations to improve safety, but the accident hastened the demise of the shuttle as America's manned space vehicle. The plane crash is the third in less than two weeks in the state.